Parker 51 Plum with fine nib. 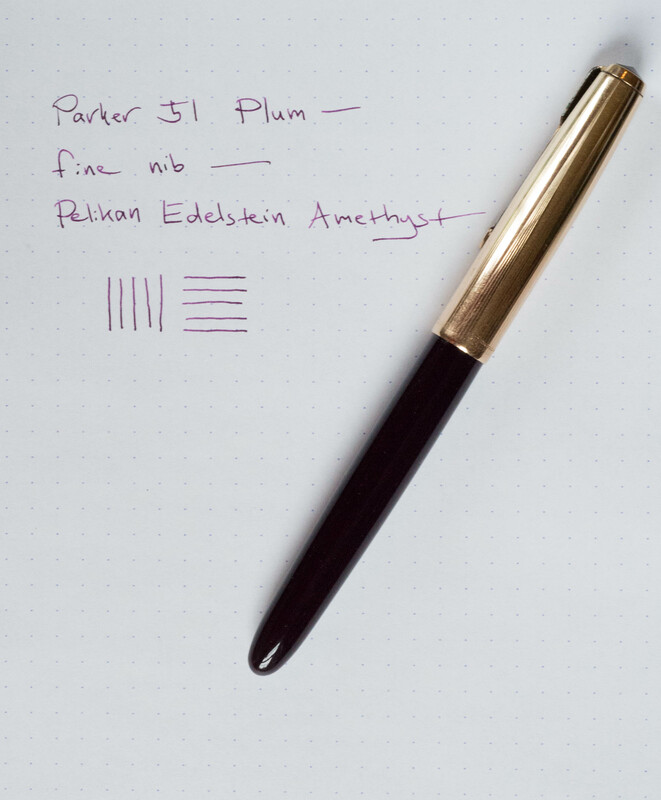 This particular Parker 51 is the color Plum, which was produced only for about a year or so. No, you can’t tell by looking at the photograph, which is how I chanced upon mine. The color is so dark it tends to look black, brown or burgundy in photographs. It was entirely by accident, then, that I bought this on eBay. Even in real life, however, the Plum color isn’t particularly noticeable. 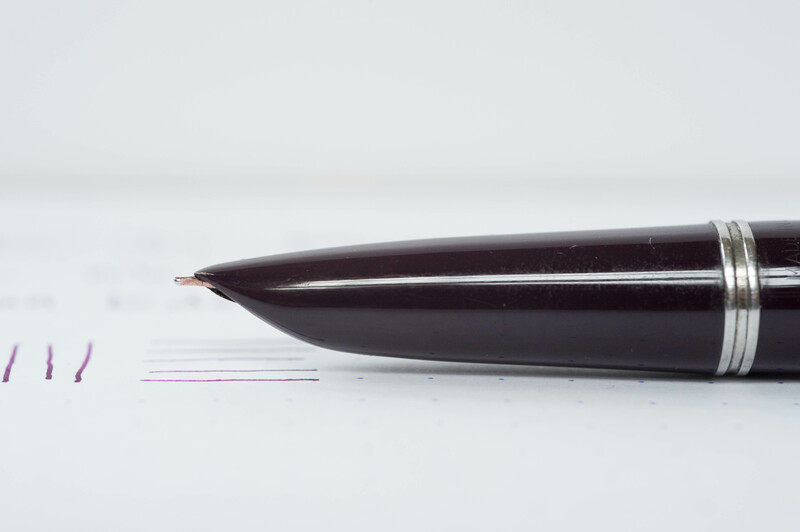 However, I’ve always liked writing with the 51’s straight-forward, business-like fine nib, no matter the pen’s color. 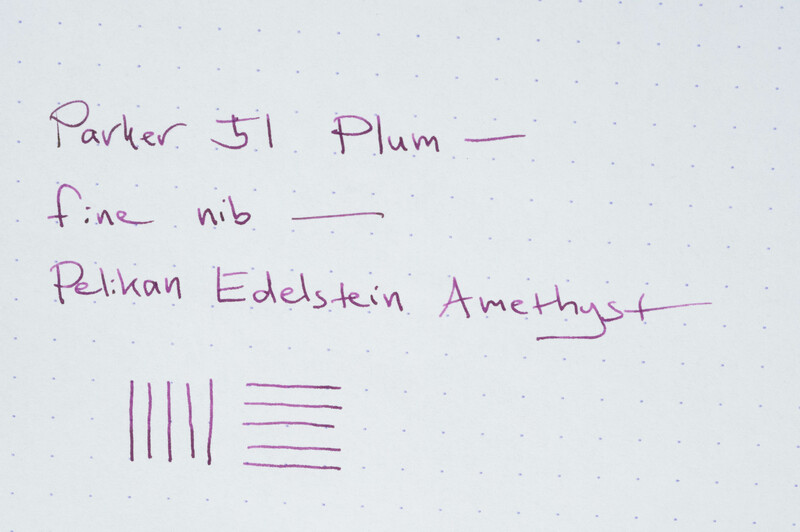 I’m using Pelikan Edelstein Amethyst, Pelikan’s 2015 ink of the year. It’s a red-leaning purple with a soft, friendly look and beautiful shading. It seems to clean up easily for a purple ink. I’m smitten. Because it’s a limited edition ink, it won’t be around forever, and I’m sorely tempted to buy a bottle. Oh wow. I’m not the biggest fan of the 51, but the Plum with gold cap is absolutely stunning. What a great find for you!